Did you catch founder Emily Paster on WCIU's "You & Me This Morning" talking about easy, homemade Valentine's Day gift ideas? If you are visiting this site for the first time, welcome! 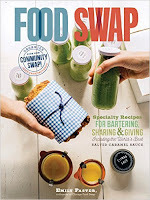 You can register for the February 15 Chicago Food Swap here. If you would like the recipes that Emily demonstrated during her segment, here they are! Enjoy making homemade treats for all of your Valentines! Melt butter and chocolate in a double-boiler set over simmering water OR a heavy-bottomed pot over a very low flame. Stir to combine. Remove from heat as soon as the chocolate is melted and watch for scorching. Scrape chocolate mixture into a quart-size plastic bag and squeeze the chocolate into one corner of the bag. Cut off the very tip of the corner of the bag containing the chocolate. 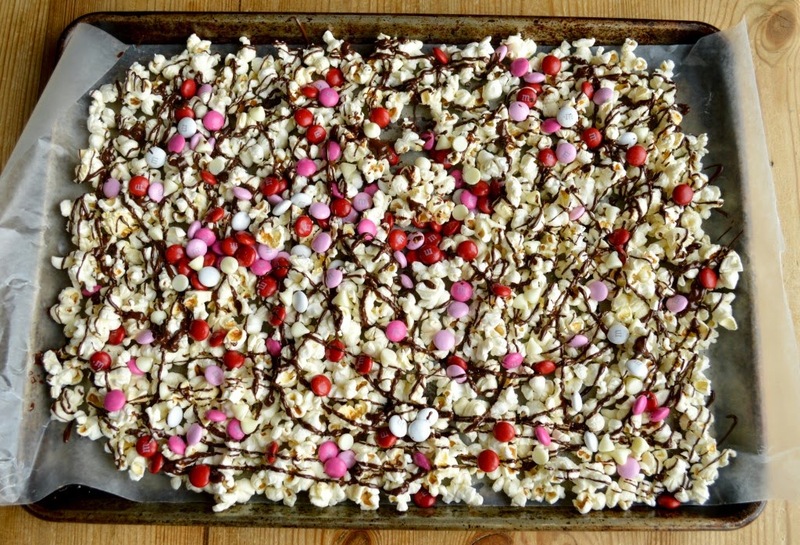 Gently squeeze the bag to pipe the melted chocolate over the popcorn -- an older kid can do this with supervision. If desired, gently pack the popcorn mixture into jars -- a funnel helps here -- and decorate. Place the cranberries in a clean, quart-sized Mason jar. Crush or pop some of the cranberries to release their juices. Cut just the peel, not the white pith, from the lime in long strips using a vegetable peeler and add to the cranberries. Cover with at least two cups of vodka or more if there is room. Allow the mixture to steep in the refrigerator for several days, shaking it several times a day. When the infusion is ready, strain out the cranberries and lime zest using a fine-mesh strainer lined with cheesecloth. Squeeze the fruit in the cheesecloth to extract as much liquid as possible. Pour the infused vodka into pretty glass bottles for swapping and label. Finely chop the chocolate and place the pieces into a heat-proof glass bowl. Pour the warm cream over the chocolate and stir vigorously to combine. It is imperative that the mixture be completely smooth. (If the cream was not warm enough to melt the chocolate completely, place the bowl in the microwave and heat in ten-second increments until the chocolate is completely melted and the mixture is smooth.) Add the Chambord and softened butter. Cover the bowl and refrigerate until the mixture is firm, about two hours. Cover two baking sheets with parchment paper. Using a melon baller or two teaspoons, scoop round teaspoons of ganache onto the prepared baking sheets. You should be able to get at least three dozen. Package the truffles by the dozen in a treat bag, or for a fancier presentation, place each truffle in an individual paper or foil candy cup and place a dozen in a treat box. The look of love won't be supplanted.